Posted on 4, April 2016 by EuropaWire PR Editors | This entry was posted in Austria, Industrial, Metals and Minerals and tagged Mexican steel producer, sponge iron, TYASA, voestalpine. Bookmark the permalink. Linz, Austria, 04-Apr-2016 — /EuropaWire/ — Construction of the voestalpine direct reduction plant in Texas, USA, is proceeding rapidly. Initial tests on sections of the plant have already commenced so that from today’s standpoint it can be assumed that production will start this summer, largely as planned. In future the Group will produce high-quality HBI (hot briquetted iron, or sponge iron), a sophisticated pre-material used in steel production, at the new site near Corpus Christi. Market demand for voestalpine HBI remains high. 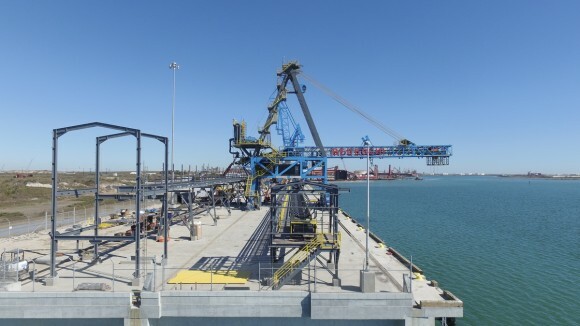 After having successfully secured long-term supply contracts with prestigious customers over the past months, voestalpine has recently signed another purchase contract which runs for several years with Mexican steel producer TYASA for several hundred thousand tons of the sponge iron from Texas. The new direct reduction plant, built according to state-of-the-art environmental standards, will go into operation this summer and produce two million tons of HBI per annum starting in the next business year. Around 40 percent (800,000 tons) of this high-quality pre-material used in steel production is destined for voestalpine’s Austrian production sites in Linz and Donawitz, where it will serve to further optimize the production process. The remaining 60 percent will be sold to external partners, primarily steel producers in the NAFTA region. With the current TYASA contract, a total of around 80% of the production volume has been placed even before the plant goes into production. TYASA, a steel producer based in Orizaba, in the state of Veracruz in the south of Mexico, has secured its supply of several hundred thousand tons of the high-quality basis material for the coming years. The company has recently increased its crude steel capacities significantly, and is now expanding its product portfolio with sophisticated steel grades. In addition to its existing product range, in future TYASA will produce high-quality flat steels which require the use of ore-based pre-materials. The excellent metallurgical properties of voestalpine HBI play a major role here. “We can achieve a jump in production quality by using voestalpine HBI in the modern electric arc furnaces at the site in Orizaba. We also reduce our dependence on Mexico’s volatile scrap market and imports of scrap from the USA,” explains Oscar Chahin Trueba, CEO of TYASA. The voestalpine Group is a steel-based technology and capital goods group that operates worldwide. With around 500 Group companies and locations in more than 50 countries and on all five continents, the Group has been listed on the Vienna Stock Exchange since 1995. With its top-quality products, the Group is one of the leading partners to the automotive and consumer goods industries in Europe and to the oil and gas industries worldwide. The voestalpine Group is also the world market leader in turnout technology, special rails, tool steel, and special sections. In the business year 2014/15, the voestalpine Group reported revenue of EUR 11.2 billion and an operating result (EBITDA) of EUR 1.5 billion; it had around 47,500 employees worldwide.